Please get your Jihad over there.
" ( The people in Oaxaca ) they hate the APPO. They hate them so much they want to hurt them and kill them. " -Brian Conolly, Boston Indy Media Center. Why are angry jewish kids from Harvard stealing and burning buses, harrasing locals, and spreading tourism ruining rumours around the world in Mexico ? Who is paying for their street blocking , bus burning, regime overthrowing armed extortionists drug habits and why ? "Inversely, if Mexico, Syria or Iraq kept better tabs on Bradley Will, Brian Conolly, Kelly Lee, or Mike Wartofsky, then various wannabe revolutionary human intelligence and armed struggle students could be screened out of the international hospitality process. I am not talking about keeping Peter Tosh from his reggae performances with a red X. I am talking about keeping crackers on warfare safari from wilding in third world countries while drawing the fire of paramilitaries onto local peasants." "Israel" and the Jews are the biggest players in a culture of violence. We have created a culture of violence (Israel and the Jews are the biggest players) and that Culture of Violence is eventually going to destroy humanity. "He was doing God's work,"
Immediately following the UN take over of the US Canadian EU funded AU PAE troops occupying Darfur Sudan and George Bushes signing of the Sudan Accountability and Divestment Act (of war) " Instant Karma " strikes a US Agent in Sudan. ground of neo imperialism, Clark University. occupied south to solidify the US Agenda. liberal re colonization of Africa. To make the world safe for capitalism and capital "investment"
mineral, water rights and patents) must be "incorporated" or "owned". open for all for the benefit of all. billions of dollars to destroy that culture. Kwame Nkrumah: Neo-Colonialism, the Last Stage of imperialism. the imperialists and facilitate thier operations. them to zionist imperialist dollarism. The institution of private land ownership being a major imperialist strategy. self-sufficient in a non-money economy. Info that he was working on a propaganda project specifically about "education"
country that is unstable and unreliable." which organization he was working for." the negligence displayed by Bhutto's security detail." on Foreign Relations ICG Agent. 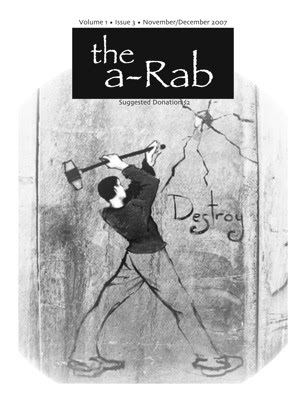 The a-Rab is coming. Keep your eyes open and report any suspicious activities. Protest of Tutu's warmongering Against Sudan, Myanmar and China. Tutu has joined in with Billioniare Tycoon Richard Branson and the "Save Darfur" campaign which who engineering a economic siege and US led international military invasion of Africa's largest oil, uranium, thorium, copper and gum Arabic rich, Palestine supporting nation. Billioniare Tycoon Richard Branson driving a tank across virgin Cola's competitor " killer" Coke a Cola.
" Let us make one thing absolutely clear as unambiguously as possible... We believe in the viability of the so-called two state solution, i.e. of an Israel with its original borders before the six day war, an Israel sovereign and independent recognised and acknowledged as such by the international community and its Arab neighbours entitled to safe and secure borders as acknowledged in international law and a Palestinian state that is viable, accessible, sovereign and with borders acknowledged and respected by all." 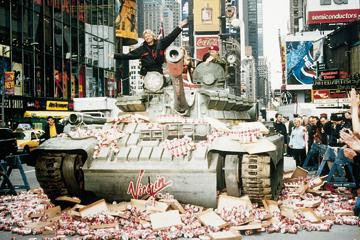 Tutu's name brand support and a highly financed international astro turfing campaign have been instrumental in legitimizing the New York based push for an invasion force of US, UN, AU, and PMC (Private Mercenary Corporation) Dyna Corp, PAE Loockheed troops to dismember and eviscerate pro Palestine Sudan. Under pressure from Tutu and his fellow pro war activists the UN just broke all its own rules to give a secret, executive, no bid contract to one of the largest mercenary corporations in the world, PAE Lockheed to build dozens of foreign military bases in Sudan's oil, uranium, copper, thorium, aquifer and gum Arabic rich Darfur region. Tutu's trips on billionaires private jets are not stopping there. He has both neo liberal gattlin guns blazing by calling for regime changing sanctions against Myanmar and economic warfare against the Chinese in the form of a boycott of the Bejin olympics. Jewist billionaire George Soros has targeted Mynamar(Burma) for overthrow and whole sale liquidation. His well funded lie factories including Move On, HWR Human Rights Watch, Avaaza, Burma net, Democracy Now, NED National Endowment for Democracy and Gene Sharps 'Einstein Institute' have been scripting Tutu's war cries against Mynamar. Tutu exposed himself further in joining New York's soon to be trillionaire Zionists such as the Carlyle group's David Rubinstein and their media empires in attacking China and calling for economic warfare against China's autonomy from subjection to the US Zionist capitalist conspiracy. Additionally Tutu joined the left zionist Sabeel group in condemning armed resistance to the genocidal jewish zionist's ethnic cleansing of Palestine.
" Victory to the New Intifada !" About 7 Boston cops arrived with the Ursala from the National Lawyers Guild and drove us away with blows and threats down the side walk and across the street to a "protest zone" to the delight of a jewish supremist ISM activist and his henchmen. The Jewish Community Relations Council protested the sabeel conference on both days. They are apposed to Sabeels and tutus approach of returning a small part of Palestine to its rightful owners in an effort to save the zionist project. The Zionists at JCRC have pro settler rallies where they chant "Kill all the Arabs !" 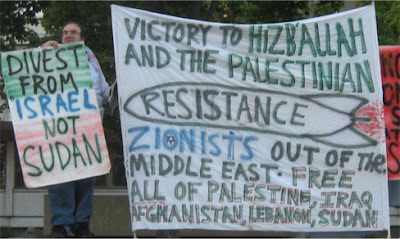 and hold up signs calling for the ethnic cleansing or "Transfer" of the remaining Palestinians and howl for the blood of anyone who supports the Palestinians struggle to liberate their country ie lebanon's hezbolla, Iraq's Saddam, Iran, Sudan, and the Afgan Taliban. Left zionists like sabeel realize this approach will expose and ruin everything quickly so they say Palestinians should be giving back a little bit of the stolen land or even the original name of all of it as long as jewish zionist colonizers get to stay on it and they can dictate its form of government ie not islamic. Tutu " has called for sanctions to be imposed on Sudan unless it agrees to UN troops in Darfur...He said the UN should give Sudan a deadline and say to the government: "If you do not agree to a peacekeeping force, you will have to face sanctions"
"He also suggested that a UN force could be sent to into Sudan, even without the government's permission, under the guise of seeking to arrest the officials accused of war crimes. However, the Security Council resolution which backed the creation of a UN force said it could only be deployed with Sudan's approval. " Desmond Tutu attacking Burma and announcing economic warfare against China. Tutu's "Coalition of the willing and coalition of the unwilling"
Sun Oct 7th 3:00-5:00 PM anti-war protest. On the 6th anniversary of the start of the current US invasion and occupation of Afghanistan. "Boston yesterday became the third US city to hold the Dream for Darfur Olympic Torch Event. Similar events have been held in countries that have experienced genocidal violence, including Rwanda, Armenia, Germany, Bosnia, Cambodia, and the border of Chad and Sudan, Savitt said." "Speakers competed to be heard with a group of about a dozen people gathered nearby chanting, "Liars" and, "Stop the racist lies." Members of groups including Boston Anti-Zionist Action and the Troops Out Now Coalition, held signs that read, "Free Palestine" and "Stop Attacking Sudan." They said that if the United States intervenes it would steal Sudan's resources." "..shouting slogans like "from Kabul to Jenin, victory to the mujahideen" and "From the river to the sea, Palestine must be free!" Why do rich Boston Zionists plot the death squad invasion of Africa's largest nation ? "Well, if you're one of Boston's Jew-obsessed lunatics, this is called a target rich environment. Where else is it possible to display what a complete douche you are in front of such a diverse group of exceptional people? An opportunity not to be missed! US/NATO out of Afghanistan! 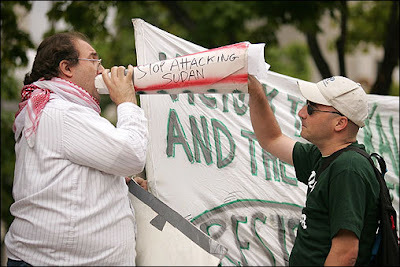 Stop the US/Zionist war on Sudan! Free All of Palestine! This weekend is the 6th anniversary of the start of the current US invasion and occupation of Afghanistan. Members of the Green Party of the US Peace Action Committee have called for nationwide protests this weekend against the US/NATO war and occupation in Afghanistan. Boston Anti-Zionist Action (BAZA) is calling for an anti-imperialist demonstration at Government Center, Boston, this Sunday, Oct 7, at 3 PM til 5PM. The time has been chosen to coincide with and confront a racist pro-war rally against Sudan organized by the JCRC (Jewish Community Relations Council of Greater Boston). "...Tensions rose during the rally when dissenting groups criticized the protesters' efforts. Co-chairwoman of the Massachusetts Coalition to Save Darfur Sifa Nsengimana tried to calm the crowd. "Let's wave to our friends up there," Nsengimana said, referring to the counter protesters. "They have the right to say what they want, so let's just let them say it and keep our focus on the stage." BAZA ( http://www.bazabaza.blogspot.com )and our allies will be demonstrating against the war in Afghanistan, against the US/Zionist war on Sudan, and to call for Zionists Out of All of Palestine and the Middle East. All decent justice-and-peace loving people, please join us at 3 PM at Government Center this Sunday. "...Speaking of BAZA-- one of their activists attempted to anonymously post a litany of anti-Semitic slogans to the comments section of this blog. I did something I very rarely do-- reject the comment..."
Victory to Hizballah! Victory to Hamas! Stop the US War in Congo. Why the sudden interest in Myanmar (Burma) ? A major covert spook outfit "The Albert Einstein Institute" has its safe houses right here in Boston. They have been running regime overthrow operations in Myanmar. Why not read into this then stop by and see what the CIA is up to. Gene Sharp The Albert Einstein Institute 427 Newbury Street Boston Ma. When CIA realized how useful could the Albert Einstein Institution be, it brought Colonel Robert Helvey into play. An expert in clandestine actions and former dean of the Embassies’s Military Attachés Training School, "Bob" took Gene Sharp to Burma to educate the opposition on the non violent strategy for criticizing the cruelest military junta of the world without questioning the system. By doing this, Helvey could identify the "good" and the "bad" opponents in a critical moment for Washington: the true opposition, led by Mrs. Suu Kyi, was labeled as a threat to the pro-American regimen. «Bob’s» job was easily done. Since he was military attaché in Rangoon from 1983 to 1985 and helped to structure the dictatorship, he knew everybody. By playing a double game, Colonel Helvey simultaneously directed a classical action of military support to Karen resistance: by providing weapons and controlling a limited guerrilla, Washington wished, indeed, to maintain the military junta under pressure. Burma’s “Saffron Revolution,” like the Ukraine “Orange Revolution” or the Georgia “Rose Revolution” and the various Color Revolutions instigated in recent years against strategic states surrounding Russia, is a well-orchestrated exercise in Washington-run regime change, down to the details of “hit-and-run” protests with “swarming” mobs of Buddhists in saffron, internet blogs, mobile SMS links between protest groups, well-organized protest cells which disperse and reform. CNN made the blunder during a September broadcast of mentioning the active presence of the NED behind the protests in Myanmar. For readers unfamiliar with the NED and its anti-democratic “democracy” cohorts, a brief introduction to the work of Professor William I. Robinson is in order. Simply put, Robinson hypothesised that as a result of the public backlash against the US government’s repressive and covert foreign policies in the 1970s, foreign-policy-making elites elected to put a greater emphasis on overt means of overthrowing “problematic” governments through the strategic manipulation of civil society. The concert-master of the tactics of Saffron monk-led non-violence regime change is Gene Sharp, founder of the deceptively-named Albert Einstein Institution in Cambridge Massachusetts, a group funded by an arm of the NED to foster US-friendly regime change in key spots around the world. Sharp’s institute has been active in Burma since 1989, just after the regime massacred some 3000 protestors to silence the opposition. CIA special operative and former US Military Attache in Rangoon, Col. Robert Helvey, an expert in clandestine operations, introduced Sharp to Burma in 1989 to train the opposition there in non-violent strategy. Interestingly, Sharp was also in China two weeks before the dramatic events at Tiananmen Square. U.S. covert support for the opposition in Myanmar is based on a rapidly expanding U.S. involvement back into South Asia. Growing U.S. corporate concern with China’s growth and the Pentagon’s drive to implant a new generation of U.S. bases to control the Straits of Malacca is leading to a renewed U.S. involvement in the region. Some 80 percent of the oil bound for China passes through these straits. The real attitude of U.S. imperialism toward the movement in Myanmar will not be guided by Washington’s concern for democratic change. It will depend on U.S. economic interests and strategic military plans in the region. On ICGs board is Henry Kissinger and Zbigniew Brzezinski who engineered the soviet invasion of Afghanistan to use it as a battle ground to inflict on the Soviet Union a military and moral defeat on the scale the US suffered in Vietnam. Additionally ICGs advisory council is made of multinational energy strip mining conglomerates and looter banks such as JP Morgan and credit Suisse. 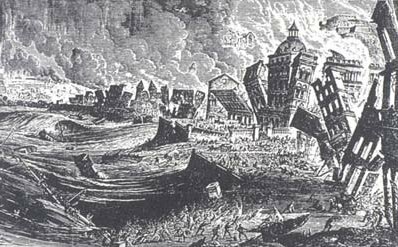 The campaign to overthrow the government of Myanmar is based on lies and is nothing more than a Zionist imperialist war, regime change and color coded franchised revolution for the privatization and neo liberal evisceration of Myanmar’s oil, gas, precious gem and teak wood resources, strategic ports and markets including currently shut down opium production. It’s also a front on the Zionists and imperialists war on China and war on China’s “weapons of mass production”. “ If Move On (and their new front group Avaaz) were an anti-war group they would have a petition to stop the US/Ethiopian occupation of south Somalia - where this weeks Washington Post article admits the Ethiopian (US-proxy) troops have killed 1000 people in "recent weeks" - instead of having an imperialist pro-war petition against Myanmar where all they can come up with is that the the Myanmar government allegedly shot 9 demonstrators. The "israeli" zionists, funded by our taxes, kill more Palestinians than that every week in Gaza. I don't see any petitions for Palestine from Move On. Note that U.S. assistant secretary of state Jendayi Frazer (who is mentioned in this article as having gone to Mogadishu Somalia recently to support the phony puppet government that the Ethiopians/Americans have set up there to try to justify the occupation) also was the Bush administration speaker at the pro-war rally against Sudan in April 2005 in Washington DC. Move On, and Jewish billionaire George Soros's other groups, have played a large role in inciting war against Sudan as well. The anti-Sudan and anti-Myanmar propaganda are both tactics in imperialist economic warfare against China. "China has a trade surplus meaning they have amassed a fortune of currency from selling Americans every disposable consumer item their credit cards can handle. New York billionaires want all that money and control over all the Chinese currency, trade and economic activity the same way they control the US currency thru the Federal Reserve Bank Corporation. The threats to boycott the Olympics are just a extortion shake down to extract huge amounts of cash payoffs in the form of Chinese investments in New York money peoples private equity firm IPOs such as Rubenstein’s Carlyle group." "Burma is huge in the heroin trade Burma and the Golden Triangle was the largest supplier of heroin for a long time. (until the current administration shut it down to the western drug lords dismay) Now it's Afghanistan and Mexico is coming on fast. In the drug trade, it's all about monopoly. Oil will always be 2nd to the drug trade over all in profits. Just so happens oil is high at the moment." Burma in the news at the moment is about DRUGS! Oil, Drugs, Banking, Precious gems or Gas ? I suspect it's a little of all. US Industry/Think Tank blue print and talking points for the war on China and war on China’s “weapons of mass production”. the rise in fuel prices had not been exploited by political opportunists," he said. Sanctions , Regime Change , Franchised Color Coded Revolutions, Neo Liberal Reforms, Low Intensity Democracy. "One of the first and best known cyber campaigns confronting the Rangoon government is Burmanet, an e-mail service that distributes news about the country. A mainstay for activists and journalists covering the country, Burmanet is sponsored in part by the financier George Soros. ….Collecting information about human rights abuses and delivering them to Internet-enabled offices along the Thai border is now one of the group's priority operations." Billioniare George soros also funded Tienemman square to destabilize China and seize control of Chinas economy. On ICGs board is Henry Kissinger and Zbigniew Brzezinski who engineered the soviet invasion of Afghanistan to use it as a battle ground to inflict on the soviet union a military and moral defeat on the scale the US suffered in Vietnam. Additionally ICGs advisory council is made of of multinational energy strip mining conglomerates and looter banks such as JP Morgan and credit Suisse. The use of satellite data: it should be noted the funding of this comes from … “Bromley’s group got funding from the Open Society Institute and the John D. and Catherine T. MacArthur Foundation.” The Open Society Institute is the brainchild of George Soros, who was demonized earlier this week for his funding of Move On and other political activities in the US. Soros’ money is being used to unduly influence the election via front groups, a practice that is called “astroturfing” where a small number of manipulators form fake “grass roots” groups that are then given pulbicity in the press who is under the impression that their opinions are a true grass roots representation. The United Nations credits Myanmar’s central government for leading opium eradication. China has played a major role pressing opium growers to eradicate. Well, its said that the fuel crisis sparked off the protests, and this suggests that it has something to do with western controlled institutions. "The skyrocketing fuel prices are said to be part of the military junta’s economic and financial reform program, coinciding with the high-level mission to Burma by the International Monetary Fund and the World Bank. " "Activist media sources essentially saying that the Burmese resistance are tools of the West and that we should not support them...yes, it upsets us. A lot." Next week which corporate media propaganda blitz do you think you'll be dancing to? "If and when it comes out that the USuk was behind the uprising (as claimed by the junta at the UN), you're going to look pretty damn silly." For the Decisive Victory of Myanmar against Imperialism and the Defense of her Ethnic Character and Territorial Independence! On the occasion of on-going disruptions against the peace and security of Myanmar, orchestrated by the global imperialists and carried out by traitors to the nation, the North American Committee Against Zionism and Imperialism (NACAZAI) declares its total solidarity with Myanmar and her leadership against internal and external enemies of people. The leading "dissident" of Myanmar, San Aung Suu Kyi, is little more than a puppet of western imperialism and cosmopolitan death. She has been praised by such mouthpieces as US President Bush, and seeks the goal of a liberal western-oriented Myanmar assimilated into the "global community". One finds in these committees to "Free Burma" a blatant affinity for liberalism, and demands that US and western imperialist countries intervene politically and militarily in order to "save" them. They constitute a toilet bowl of western intellectuals and those of Myanmar's compatriots who posses a deep alienation with the dynamic self-pride of their people's culture. The people of Myanmar are under the radar guns of the enemy, aside from geo-political reasons and issues of wealth from national resources and the illicit drug trade which the regime has squashed, primarily because they are a proud nationalistic people deeply unsuited to globalism. As part of the international conspiracy of the enemies of nations, Myanmar is sought for "regime change" so to as to destroy the conscious racial identity of Myanmar, her nationalistic and patriotic outlook, her strong family structure, the fanatical love of Buddhism as expressed by her peasant classes, and the capacity of Myanmar to defeat an imperialist invasion with the twelfth largest military in the world. Hence, regardless of any legitimate need for the transformation of social relations in Myanmar and emancipation of her worker and peasant classes, the overwhelmingly primary contradiction is between the Myanmar nation and the forces of imperialist subjugation and eternal death from national nihilism. We ruthlessly condemn all measures of sanctions and embargoes directed against Myanmar, and reject the globalist conspiracy to isolate her politically from the friendship of nations. Furthermore, we affirm that all progressive and revolutionary forces of the world should defend the right of Myanmar to assert the sovereignty of her political and territorial independence. The overwhelmingly greatest enemy of Myanmar is not any regime, past or present, but US and Western European imperialism, and those attached to it. Victory to Myanmar in the anti-imperialist showdown! Down with the enemies of a world made of nations! Why the sudden interest in Burma? Stop The US Zionist, Imperialist, Jewish Billioniares War On China and China's "Weapons of Mass Production"
"China wants to build the pipeline to reduce its dependence on oil tankers traveling through the Strait of Malacca with shipments of crude oil from the Middle East and Africa." “…And by getting rid of the current regime, Burma will become integrated into the international banking system, which will keep the Burmese enslaved. “ If Move On (and their new front group Avaaz) were an anti-war group they would have a petition to stop the US/Ethiopian occupation of south Somalia - where this Washington Post article admits the Ethiopian (US-proxy) troops have killed 1000 people in "recent weeks" - instead of having an imperialist pro-war petition against Myanmar where all they can come up with is that the the Myanmar government allegedly shot 9 demonstrators. The "israeli" zionists, funded by our taxes, kill more Palestinians than that every week in Gaza. I don't see any petitions for Palestine from Move On. Note that U.S. assistant secretary of state Jendayi Frazer (who is mentioned in this article as having gone to Mogadishu Somalia recently to support the phony puppet government that the Ethiopians/Americans have set up there to try to justify the occupation) also was the Bush administration speaker at the pro-war rally against Sudan in April 2005 in Washington DC. Move On, and Jewish billionaire George Soros's other groups, have played a large role in inciting war against Sudan as well. "China has a trade surpus meaning they have amassed a fortune of currency from selling americans every diposable consumer item thier credit cards can handle. New York billionares want all that money and control over all the chineses currency, trade and economic activity the same way they control the US currency thru the Federal Reserve bank Corporation. The threats to boycott the olympics are just a extortion shake down to extract hugh amounts of cash payoffs in the form of chineses investments in New York money peoples private equity firm IPOs such as Carlyle Group." "Burma is huge in the heroin trade Burma and the Golden Triangle was the largest supplier of heroin for a long time. Now it's Afghanistan and Mexico is coming on fast. In the drug trade, it's all about monopoly. Oil will always be 2nd to the drug trade over all in profits. Just so happens oil is high at the moment." Burma in the news at the moment is about DRUGS! Oil, Drugs, Banking, or Gas ? I suspect it's a little of all. Here is the US Imperialists/Think tank blue print and talking points for the war on china. Stephen Zunes of the International Center for Nonviolent Conflict and Tikkun does damage control after getting busted fellow traveling with the CIA, Pentagon, DARPA, The US State Department and The US Air Force. 2003 and 2004 were the years of the two Georgian “Rose Revolutions,” in which Mikheil Saakashvili displaced Eduard Shevardnadze. A role was played by western foundations such as the Albert Einstein Institute, with which Butkevicius was allegedly associated. Mr. Soros established his first foundation, the Open Society Fund, in New York in 1979 and his first Eastern European foundation in Hungary in 1984. ...In November 1989, Case Western Reserve in Cleveland, Ohio, under the aegis of that university's "Program for Social Innovations in Global Management," began a series of conferences to review progress towards that strategic objective, which was reported on in "Human Relations" in 1991. There, Dr. Howard Perlmutter, a professor of "Social Architecture'' at the Wharton School, and a follower of Dr. Emery, stressed that "rock video in Katmandu,"
A Civilian Revolution in Military Affairs The emphasis on the use of new communication technologies to rapidly deploy small groups, suggests what we are seeing is civilian application of Secretary Donald Rumsfeld's "Revolution in Military Affairs" doctrine, which depends on highly mobile small group deployments "enabled" by "real time" intelligence and communications. Squads of soldiers taking over city blocks with the aid of "intelligence helmet" video screens that give them an instantaneous overview of their environment, constitute the military side. Bands of youth converging on targeted intersections in constant dialogue on cell phones constitute the doctrine's civilian application. This parallel should not be surprising since the US military and National Security Agency subsidized the development of the Internet, cellular phones, and software platforms. From their inception, these technologies were studied and experimented with in order to find the optimal use in a new kind of warfare. The "revolution" in warfare that such new instruments permit has been pushed to the extreme by several specialists in psychological warfare. Although these military utopians have been working in high places (for example the RAND Corporation) for a very long time, to a large extent they only took over some of the most important command structures of the US military apparatus with the victory of the neoconservatives in the Pentagon of Donald Rumsfeld. in the new Postmodern Coups, especially through its top figures, Dr. Peter Ackerman and Jack DuVall. According to its website, the center "develops and encourages the use of civilian-based, nonmilitary strategies to establish and defend democracy and human rights worldwide." It "provides assistance in the training and deployment of field advisors, to deepen the conceptual knowledge and practical skills of applying nonviolent strategies in conflicts throughout the world where progress toward democracy and human rights is possible." Connie Bruck, "The World According to Soros," New Yorker, January 23, 1995.